It’s 8:30 Saturday night. I stand in a sort of top-floor courtyard looking out across Addis Ababa. The city is cloaked in damp mist that it just cannot seem to shake after the days torrential rains. Flashes of light against the gathering darkness speak of storms waiting their turn to unleash their water on an already sodden city. From my vantage point, I can see inside the mosque, where white robed figures have gathered again for prayer. They’ve been praying for well over an hour (or rather the Imam has, broadcast for all the neighborhood over loudspeakers), now standing, now falling face to the floor. While the sound of the prayers at the various hours of the day was at first a novel reminder that we were in an “exotic” location, embarking upon a new chapter in our lives, the novelty wore off last night (it was their equivalent of Sunday, and the evening prayers went on for hours.) Now, I’d just like to fall back asleep in peace… I’m exhausted on so many levels. On one level, today was yet another day that my body woke me up at 4am and my mind wouldn’t let it go back to sleep. There are just too many things to try and process, but it sure makes for a long day. It’s a kind of torture to sit and think about how long the day is going to be, but be unable to go back to sleep to avoid what you know is coming. And now, when everyone else is asleep, I still can’t find enough peace to drift off. Tomorrow we’ll go to church and make one last visit to the orphanage, then we’ll pack up and get on the airplane for the 36 hour journey home. While I am really feeling ready to see our kids again, I still feel like there is so much I could or should have done here. Of course on top of the suffering and the rain there is the real challenge of parenting two new kids. I love them so much already, but I also have to admit that this process is not for the faint of heart. Parenting an 8 year old and a 2 year old with different language, different cultural expectations but with the same needs of any 8 and 2 year old is not an easy task. These kids are literally STARVING for contact. They need to be touched, to wrestle, to play, to talk, to test the boundaries of who you are and how deep your love is. Manyazewal and I spent the day making up various ways to try and get exercise while confined to a small room. We destroyed a coat hanger to make a hoop for balloon-basketball. We played baseball. We wrestled. We did push-ups and sit-ups and stretches. We wrestled some more. It was fun and served as a release from the rain and from my thoughts. It was also tiring, but in a good way. Given the choice of being tired from wrestling with the above thoughts or the choice of being tired from wrestling with two dear kids who are excited to have a daddy to wrestle with, I think you can imagine which is the clear winner. Enough for now... I'm sure there will be more sports before church tomorrow, I'd better get my rest. This may help to put my comments in proper perspective. 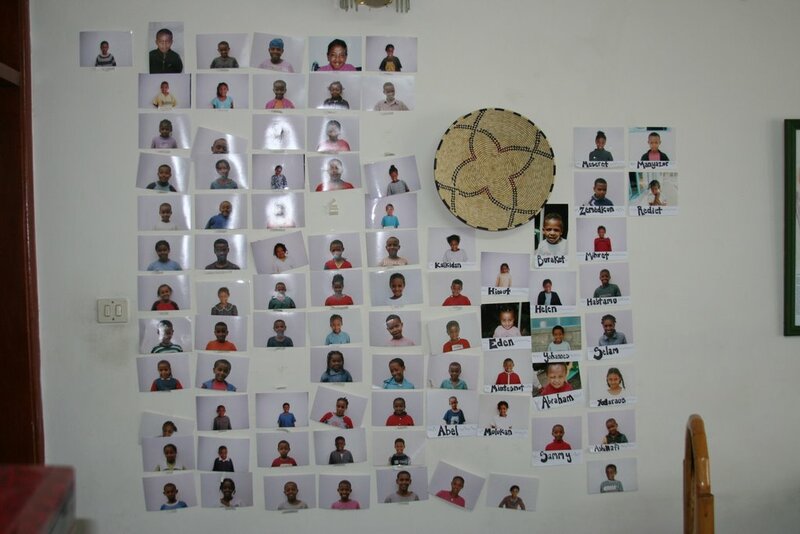 These are the pictures of the kids adopted from Layla House this year. 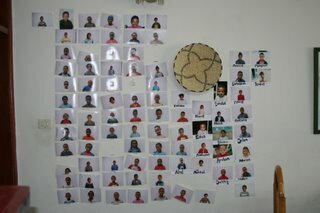 Little bits do add up... that's about 90 more kids who have homes now!